Bit O Honey is an all time favorite nostalgic candy. Bit O Honey chews are a bite size sweet and chewy candy. A chewy chunk with the great taste of honey and tiny bits of almond pieces mixed in. Hard to believe this treat is fat free. Bit O Honey chews were one time a favorite penny treat. The original bit o honey was more like a bar candy with a wax paper wrapping. These chewy bite size honey flavored treats are the same great flavor as the original bars. 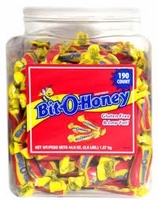 190 bit o honey bite size chews per jar.